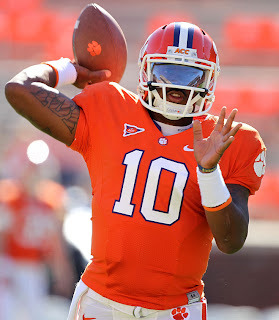 OFFENSIVE BACK – Tajh Boyd, Clemson, QB, So., 6-1, 225, Hampton, Va. Boyd completed 27 of 46 passes for 367 yards and five touchdowns in leading Clemson to 59 points against North Carolina. He also had a rushing touchdown and finished with 375 yards of total offense. Boyd tied the Clemson record for touchdown passes in a game with five and he threw them to five different Tigers. He tied an ACC record for touchdown responsibility with six total, and also tied the Clemson record as Woody Dantzler had six against NC State in 2001. Boyd’s touchdown pass total is now at 24 for the season, tied for the most in the nation and just three off the Clemson single season record just eight games into the season. RECEIVER – Chris Givens, Wake Forest, WR, Jr., 6-0, 195, Wylie, Tx. Givens caught six passes for 147 yards and two touchdowns in Wake Forest’s 24-23 win over Duke. Givens caught a 26-yard scoring pass from QB Tanner Price that put the Deacons ahead 7-0 in the first quarter. After Wake Forest fell behind 23-17 in the fourth quarter, Givens caught a pass on a curl route and turned it into a 66-yard touchdown catch, avoiding blockers and side-stepping a diving defender. Five of his six catches resulted in first downs. In addition, Givens rushed the ball once for 13 yards and a first down. Givens recorded his 23rd straight game with a reception, tied a school record with his fourth consecutive 100-yard receiving game, and also caught a scoring pass for the fifth straight game. OFFENSIVE LINEMAN – Landon Walker, Clemson, T, Sr., 6-6, 305, North Wilkesboro, N.C. Walker had a 93 percent grade and five knockdown blocks in Clemson’s 59-38 win over North Carolina. He played 82 total snaps as he helped the Tigers score 59 points, the most points Clemson has scored in the history of the series with North Carolina and the most points for any Clemson team in an ACC game since 2001. Walker did not allow a sack, an important stat as the Tigers threw the ball 46 times when he was in the game. 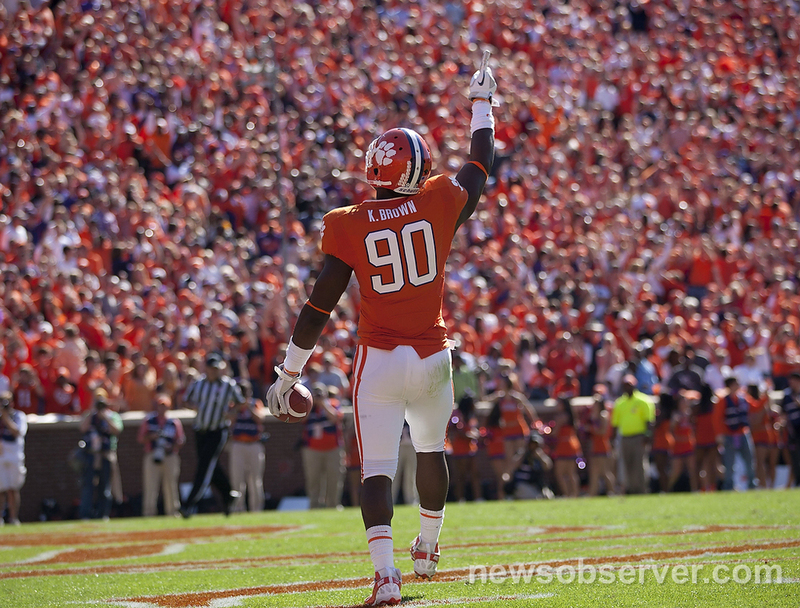 DEFENSIVE LINEMAN – Kourtnei Brown, Clemson, DE, Sr., 6-6, 255, Charlotte, N.C. Brown had two defensive returns for touchdowns in Clemson’s 59-38 win over North Carolina. 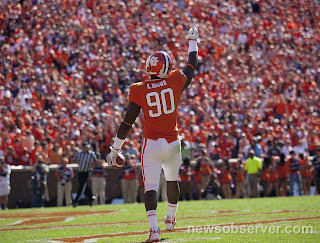 He made a leaping interception and returned it 20 yards for a touchdown to give Clemson a 24-10 lead, and picked up a fumble and ran 26 yards for a score in the third quarter, making him the first Clemson defensive player since 1954 to score two touchdowns in the same game. He was only the third FBS player to score two touchdowns by interception return and fumble return in the same game in the last 12 years. Later, Brown had his hands in on a third turnover as he deflected a pass that was intercepted by a teammate. He was also credited with two tackles. Brown was named National Defensive Player of the Week by the Walter Camp Foundation. LINEBACKER – Sean Spence, Miami, LB, Sr., 6-0, 224, Miami, Fla. Sean Spence was again the Canes’ leader on defense. The prolific linebacker played in the middle against the Yellow Jackets and racked up 10 tackles to lead all Miami players. The senior had six solo stops and a tackle for a loss of two yards. As the defensive captain, Spence helped hold Georgia Tech—one of the nation’s most potent offenses—to a season-low seven points, 35.9 off of its average. DEFENSIVE BACK – David Amerson, NC State, CB, So., 6-3, 194, Greensboro, N.C. The national leader in interceptions, Amerson added to his gaudy pickoff numbers with a pair of interceptions against the Cavaliers. 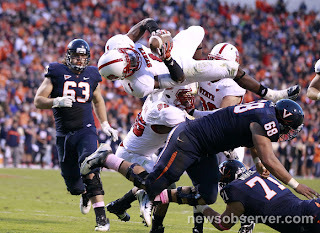 He returned his second interception 12 yards for a touchdown that more or less iced the victory for the Wolfpack. That was NC State’s first interception return for a TD this season. A sophomore cornerback from Greensboro, N.C., Amerson also recorded six tackles and returned a kickoff 25 yards. Amerson now has eight interceptions on the season, tying the school record, set in 1937 and tied in 1938, both times by Art Rooney. Amerson now has two interceptions in a single game three times in 2011, and has done so in each of the Pack’s last two games. SPECIALIST – T.J. Thorpe, North Carolina, WR, Fr., 6-0, 190, Durham, N.C. Freshman T.J. Thorpe returned a third quarter kickoff 100 yards for a touchdown, just the second 100-yard kickoff return for a touchdown in school history, the other coming by Tyrell Godwin at Stanford in 1998. Thorpe becomes just the 15th player in ACC history to return a kick 100 yards, and he finished with 182 yards on four returns, two yards shy of the single-game school record. Thorpe leads the ACC and stands 15th in the country in kickoff return average. ROOKIE – Devonta Freeman, Florida State, RB, Fr., 5-8, 200, Miami, Fla. Freeman became the first true freshman running back at Florida State to string together consecutive 100-yard rushing performances when he gutted the Maryland defense for 100 yards on 11 carries (9.1 ypc), including a 41-yard touchdown run in the fourth quarter, which matched the longest run from scrimmage by the Seminoles this season. Coming off a 109-yard performance at Duke, Freeman was instrumental in the Seminoles’ second half dominance against the Terrapins, carrying seven times for 78 yards. FSU controlled the second half clock (17 minutes) by grinding out 198 yards on 29 carries.